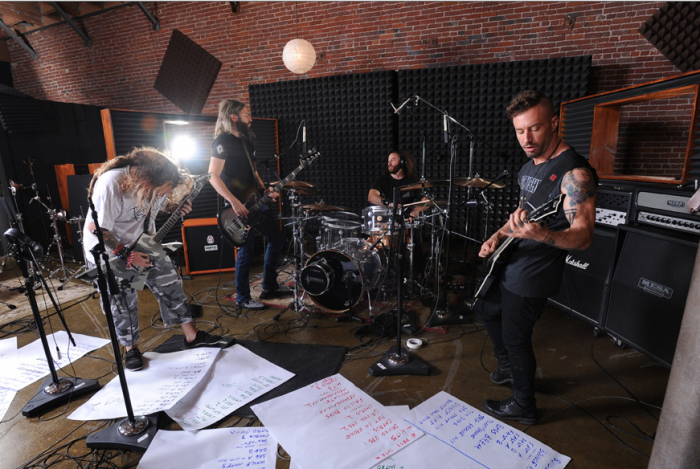 For about a year and a half, the metal community has been buzzing about a supergroup involving guitarists Max Cavalera (Soulfly, Sepultura), Greg Puciato (The Dillinger Escape Plan), bassist Troy Saunders (Mastodon) and drummer Dave Elitch (The Mars Volta). Back in October, the project was dubbed Killer Be Killed and announced a record deal with Nuclear Blast. Their debut album was recorded with renowned metal producer Josh Wilbur (Lamb of God, Gojira) at the helm and is due on May 13 in North America, and today, we finally have a taste of what we can expect on the LP as the band has premiered the tracks “Wings of Feather and Wax” and “Face Down.” Click through for the stream. If these two tracks are any indication, the band is definitely more thrash-leaning than we’re accustomed to hearing from The Dillinger Escape Plan or (especially recent) Mastodon — but with the former leader of Sepultura in the group, that also isn’t all that surprising. Cavalera, Puciato and Saunders share vocal duties on the tracks, though Puciato predictably shines, particularly when harmonizing with Saunders. I can’t wait to hear more, but how do these songs live up to your expectations? It sounds about as awful as their band name. Elitch’s drumming is the only thing really solid to me about this but even that isn’t given much to work with.